With summer solstice just a week earlier, it was a gorgeous clear summer evening in the south bay for shooting the evening sky and all the creative opportunities it had to offer. Surrounded by the creative vision of Stephen Oachs photography, the Aperture Academy Gallery provides an inspiring venue for our customary short classroom session as the first part of the workshop with professional photographers Jean Day and Paul Porter. We spent the first 30 minutes or so getting to know each other a little, the gear each of us are using and anything in particular each student wanted to work on. Jean then led everyone through a customized multimedia presentation outlining the importance of using manual setting capabilities of their cameras, including white balance, shutter speed, aperture and ISO, to optimize the opportunities for the evening's photo activities. We outlined techniques and examples for shooting pinpoint stars, longer exposures for capturing star trails and the concept of linking many back-to-back long exposures into one image with longer star trails, emphasizing that a wide angle lens provides the best angle of view for our starry images. With ideal conditions and crystal clear skies, we ventured to Almaden Meadows Park in the the luxurious 13 passenger Aperture Academy van, affectionally called the ApCab. Shooting in darkness provides unique challenges, so with just enough light as darkness enveloped us, we used the remaining available light to lock in ideal compositions and acquire ideal focus points with a nice cool white balance to provide for deep dark blue skies balanced by warm ambient light bathing the parks trees from behind. One of the most exciting things about night photography is that we can capture light in a way that our eyes cannot. Our creative vision is the only limiting factor in the almost limitless possibilities presented by the hidden light in the darkness. Cameras mounted steady on tripods and remote shutter releases at the ready, we started off with some short exposures at high ISO to double check our focus for the evenings exercises. Once everyone was dialed in, Jean started off the evening with her unique creative vision, delighting everyone in a fun long exposure light writing exercise, working fast to spell out "BELIEVE!" and "STARS" in two quickly passing 30 second exposures. Students were surprisingly delighted at their images of the luminous words floating above the ground backed by the trees and the darkening skies. With fuller darkness finally descending upon us we worked individually with the students to capture pinpoint stars, setting wide angle lenses at their widest field of view, our apertures at f4 and shutter speed around 30 seconds. Remote shutter releases engaged to prevent blur inducing camera or tripod jiggling, everyone was delighted to capture the stars, bright and sharp in the night sky. The earth spinning beneath our feet, it was time to grab us some star trails, starting first with 5 minutes and then 10 minute exposures, changing ISO and aperture needed to optimize our exposures. To capture those long sweeping arcs of star trails, one wants at least 45 to 60 minutes of star movement; noting that one must combine a series of shorter 5 to 10 minute exposures to prevent possible camera sensor damage sometimes caused by exposures longer than 10 minutes. To give the students a taste of what that was about, we had them capture this series of several 5 minute exposures, back-to-back, with no delays between captures. Following this exercise, we explained how they could combine them to acquire the longer arcs of movement, using one of several techniques of post processing their images. 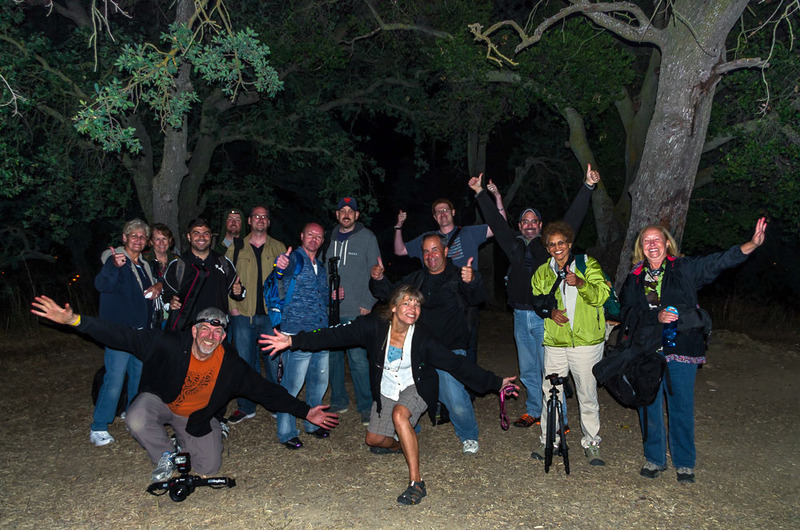 Getting ready to wrap up for the evening, we huddled together for a group shot of eager students learning to capture the unique images light that the dark side of light brings. However, no Darkside workshop should be finalized without some captures of the Milky Way. A little south of Silicon Valley, Almaden Meadows Park picks up some of the ambient city lights, making the glowing band of our home galaxy was barely perceptible to our own eyes, but we knew that the new skills learned by the students this evening would give them the power over their cameras to capture what their eyes could not. With lenses at their widest angle of view, exposure settings to widest aperture and 20 to 30 second shutter speeds, our students exploring slightly different exposure settings and their cameras drinking in the light of the night sky, students were amazed to their images of our galaxy hanging there in the sky as it extended high from the horizon. The evenings activities drawing to a close, we climbed into the ApCab for the ride back to the Gallery, where Jean provided some night photography handouts as we bid our goodbyes to our budding astrophotographers.